President Mohammad Ashraf Ghani on Sunday conferred High State Medal on security officials and security personnel and awarded High Governmental Signs, Promotions, and Cash Rewards to security forces for their leadership and services in maintaining security and fight against terrorism. The Office of the President, ARG Palace, said the Minister of Defense, Minister of Interior, and Deputy National Security Adviser in Commander-in-Chief Affairs, received Ghazi Wazir Mohammad Akbar Khan High State Medal, while the Intelligence Chief and Chief of Staff of the Ministry of Defense received Ghazi Amanullah Khan High State Medals and Gen. Murad Ali Murad received Ghazi Mir Masjedi Khan High State Medal. President Ghani also conferred Ghazi Wazir Akbar Khan, Ghazi Mir Masjedi Khan, Ghazi Mohamad Ayoub Khan, and Ghazi Mir Bacha Khan High State Medals on 29 officials and personnel of the National Defense and Security Institutions, while 72 security personnel also received High State Medals for their services in maintaining security and thwarting the enemy plots during parliamentary elections. In the meantime, the Senior Deputy Interior Minister for Security Akhtar Mohammad Ibrahimi was promoted to Lieutenant General and Deputy National Security Adviser in Commander-in-Chief Affairs and the Information and Coordination Chief of the National Security Council Office Major General Bahadur Shah Ahmadi was promoted to Lieutenant General. In his speech during the ceremony, President Ghani thanked the security personnel for their bravery and said the alertness of the national defense and security forces proved that Afghanistan will remain a free and democratic country. President Ghani further added that the national defense and security forces are being supported by the nation more than any other time as he emphasized that the brave Afghan forces have gained the independence of the country with the campaign, their blood, and bravery. He also added that the government is responsible to respect the bravery of the Afghan forces and respond to the needs of their families, insisting that the national defense and security forces have proven that they did not hesitate to lay their lives for the defense and survival of the country. According to President Ghani, the Brussels Summit is a good example of respect being given to the Afghan forces, during which the participants spoke of the bravery of the Afghan forces. 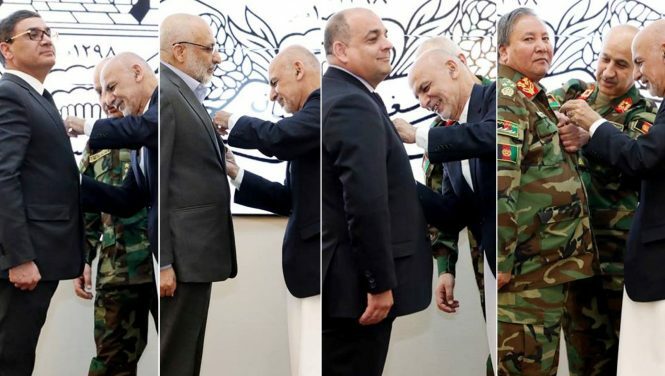 President Ghani given Medals for security officials recently.Though, he seriously warned the security personnel few days back. the rewards need to be given to those who achieved and has done well, those who did not carry out their duties in a good manner, disciplinary action may taken against them. or perhaps this could be to motivate the high official in order to smoothly run their jobs efficiently.